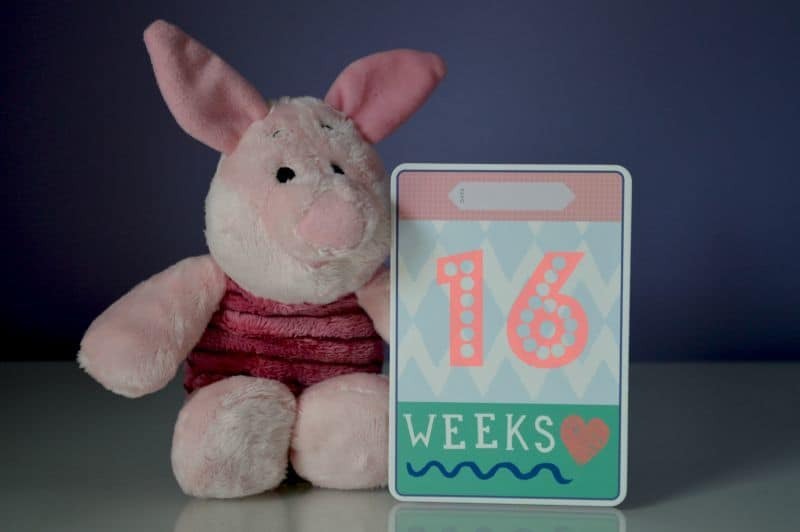 My first Piglet pregnancy update, somehow I’ve managed to get to 16 weeks in the blink of an eye. Although during the rough days in my first trimester the days sometimes felt like weeks. I’m now sporting a bump that everyone keeps commenting that am I sure that there aren’t triplets hiding in there which whilst I’m sure is meant in jest however as I wasn’t exactly small before I fell pregnant I am even more conscious of how big I look. Is starting to listen to my voice, thanks to tiny bones forming in their ears. Overall I had been feeling OK for a week or so but this week has seen the breathlessness, palpitations and dizziness start so I’m guessing that anaemia has started to take hold and that I need to get a prescription of iron tablets. I don’t think that I’ve had any real pregnancy cravings so far but I’m at the stage where I have cooked a meal, taken one bite and don’t want it. I can’t tell you what I do want, I just know it’s not whatever is in front of me. I’ve been trying to eat small regular meals rather than three times a day as I can’t face a large meal all in one sitting. When I had my booking in appointment with my community midwife at 9 weeks I was slightly concerned that I wouldn’t be getting very many checkups during this pregnancy as I had already had at least one child. Fast forward to my dating scan and I have had no end of appointments. Firstly my booking in blood wasn’t labelled correctly so I had to head back to the ante-natal clinic the day after my scan to have them repeated. Then as the sonographer was unable to measure the fluid on the back of Piglet’s neck I had to have a separate appointment for the quadruple blood test completed. This didn’t go to plan as I managed to bleed all down my arm after the test despite the cotton wool and tape. Last week I had my first consultant appointment as I am going for consultant led care due to two previous emergency caesarean sections. The registrar that I saw was lovely and she has advised me to take a regular dose of aspirin to help prevent pre-eclampsia as I had it with Roo (plus my blood pressure was up on that day). I’ve been booked in for the glucose tolerance test at 28 weeks along with a growth scan followed by a consultant appointment where I should hopefully get my date for my elective caesarean section. Finally this week I have been back to my community midwife for my 16 weeks check up this morning which went OK. A bit more of my maternity notes were completed with the results of my booking blood recorded and scan results. She also took repeat blood to check for anaemia as I’ve been feeling off-colour all week. However, now I am not booked to see her again until I am 28 weeks! which I find a little nerve wrecking as other than my scan at 20 weeks I have nothing for 12 weeks, no listening to babies heartbeat, no checks or anything until mid-September – it feels a long wait. All sounds good…wishign you the very best! Oh I hate all the comments people make about bump size! I always had the other way round- are you sure you’re so many weeks, you’re tiny etc. Which is just as annoying! At least nobody is touching it yet?? Thanks so much for linking up to #MaternityMatters – look forward to reading the rest of your journey!